The success of Woodman Lab’s little camcorder GoPro is astonishing: Founded ten years ago the company already accounts for about 20% of camcorder sales in the US and according to this source is the number one consumer camcorder on earth. The GoPro disrupted a market that was dominated by established manufacturers like Sony, Panasonic and Canon for a long time. How did they do that? 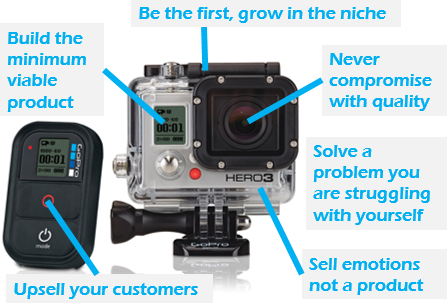 I think there is a lot for product managers and entrepreneurs to learn from GoPro. Read my list of (at least) six lessons. If Nick Woodman just would have had the idea to build another camcorder he would have failed. But Woodman had a different plan. At first he built surfer equipment to help surfers film themselves. It did not take long until skydivers, bikers, astronauts and other adventurers discovered how useful GoPro is to capture great moments. The GoPro has a clear unique selling proposition: The camera is for filming yourself when you do exciting stuff. Woodman was the first to fill that niche and that’s why all action cams of other manufacturers are and will be denounced as me-too-products. GoPro camcorders don’t have a lot of features or modes. But from the start they had a high focus on what is most important for ambitious filmmakers: Picture quality. By focusing on that key asset GoPro managed to become an important equipment for special shots in many professional video productions (Like Felix Baumgartners space jump). And knowing this makes the camera even more attractive to consumers. When building a product you should always be aware what its most important attribute is and never compromise with it. From the start the GoPro has been much more than a product. It is a lifestyle that is closely connected with exciting moments. GoPro is extremely successful in leveraging the emotional side of the product. Filmmakers all over the world put their GoPro videos on Youtube and to underline how exciting the moment was they have captured they name the clip in a way like „GoPro Indonesia 2014“. They even put the GoPro intro in the beginning of their films. And that is great advertising GoPro gets for free. When you manage to boost your product with emotions you will make sure your customers have a lot of intrinsic motivation to use the product again and again.